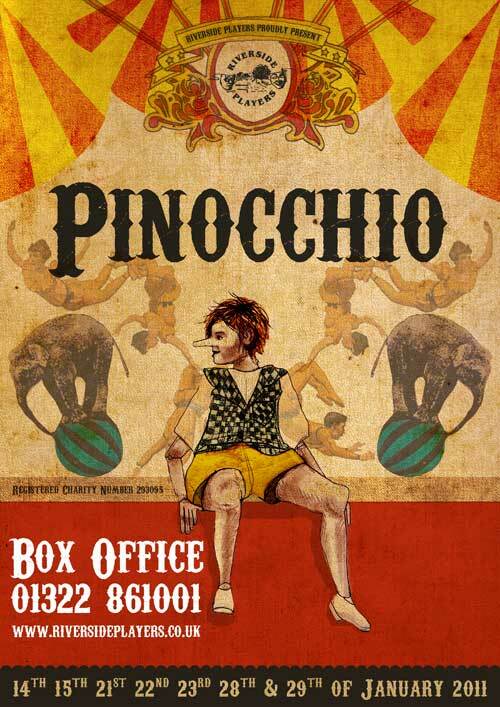 Is there anyone out there who doesn’t know the story of Pinocchio? Alan’s script pretty much sticks to the original story, but with the addition of some panto type characters. Basically, the story is of a poor carpenter who is good in thought and deed and lives in a small village with his awful sister (dame). Gepetto (the carpenter) has always longed for a child of his own. His wish is granted in so much as he is given a piece of magic wood which is transformed into a little wooden boy. The little wooden boy (Pinocchio) keeps getting into all sorts of scrapes and is easily led by other bad characters. Without going into the whole story, the different characters find themselves in puppet theatres, on the sea, inside a whale and in Brats Town, before Pinocchio sees the error of his ways, is turned into a real boy and everyone in the village gets rich quick when a casket of gold turns up!! Usual Panto stuff! !